NEW DELHI — Across India, small three-wheeled autorickshaws ferry people and goods from place to place, with tens of thousands in Delhi alone buzzing and chugging through the traffic alongside buses, cars, taxis, trucks and motorbikes. In January, the world’s first hydrogen-powered autorickshaws took to the road on the grounds of Pragati Maidan, the sprawling exposition center on the capital’s east side. The 15 blue buggies, retrofitted autorickshaws that previously used a conventional power source, still give the same noisy, windswept ride — and on a recent jaunt a driver reflexively leaning on the horn proudly produced the same ear-splitting bleat heard across India. Yet there are critical differences. The tailpipe emits water vapor, heat and scarcely any other emissions. The body is adapted to carry a tank of hydrogen gas; the motor and its injection system have been modified, and an electronic control system has been installed, developed by researchers at the Indian Institute of Technology in Delhi. Still, they refuel at a filling station in much the same way as ordinary autorickshaws fueled by compressed natural gas, hooking up to pumps and hoses with special nozzles. Hydrogen energy for transportation is in its early infancy, but many hope these autorickshaws are a step toward reduced reliance on fossil fuels in developing countries, where exhaust-belching vehicles contribute to air pollution. Clean, efficient and naturally abundant, hydrogen has the potential to “facilitate the transition to a low-carbon energy future, in a similar way that oil and the internal combustion engine displaced coal and the steam engine,” said the International Center for Hydrogen Energy Technologies, a project of the United Nations Industrial Development Organization and the Turkish government. Delhi’s hydrogen autorickshaws are the result of a three-year project involving a bevy of partners, including the U.N. development agency, which funded half of the more than $1 million cost. In-kind contributions came from partners including the Indian automaker Mahindra, which supplied the autorickshaws, and Air Products, an energy company based in Pennsylvania that provided a hydrogen re-fueling station at the expo center and technical expertise. Though the initial fleet is modest, as many as a million hydrogen vehicles could be on India’s roads by 2020, said Bibek Bandopadhyaya, an adviser to the Indian Ministry of New and Renewable Energy. That goal seems highly ambitious, given the challenges to scaling up the technology worldwide, let alone in bureaucratic India. Still, given its pressing energy demands — driven by economic growth, rising vehicle numbers and worsening air pollution — India is exploring all options for alternative and renewable energy, though with varying degrees of success. The need for clean energy is pressing in India, where big cities are shrouded in choking pollution. India ranked 125 out of 132 countries surveyed for the 2012 Environmental Performance Index from Yale and Columbia Universities in the United States, which measures air pollution and other indicators. The country was the world’s third-largest producer of greenhouse emissions last year. Hydrogen is considered a sort of holy grail of fuel, but there are substantial challenges to its development. “Hydrogen and fuel cell cars would be a revolution, and revolutions need strong drivers. There aren’t strong drivers yet, though if petroleum prices rise high enough, there may be,” said John Heywood, an emeritus professor of mechanical engineering at Massachusetts Institute of Technology who specializes in internal combustion engines. The biggest hurdles to expansion are access to enough hydrogen, lack of a distribution network and high cost relative to other fuels. While hydrogen is naturally abundant, it must be split from other elements in what are now expensive, often energy-intensive, processes. It is made for industrial purposes like producing fertilizer or refining fuel, but is not produced for mass consumer use. There is little infrastructure to transport it and fueling stations are few. Hydrogen also carries a stigma of danger associated with the 1937 Hindenburg airship disaster and the hydrogen bomb. Yet it is actually safer than gasoline if properly handled, said Nicolas Lymberopoulos, director of projects and programs at the U.N. agency and the Hydrogen Energy center: Lighter than air, it disperses quickly and tends to burn rather than explode, making it safer than natural gas, he said. 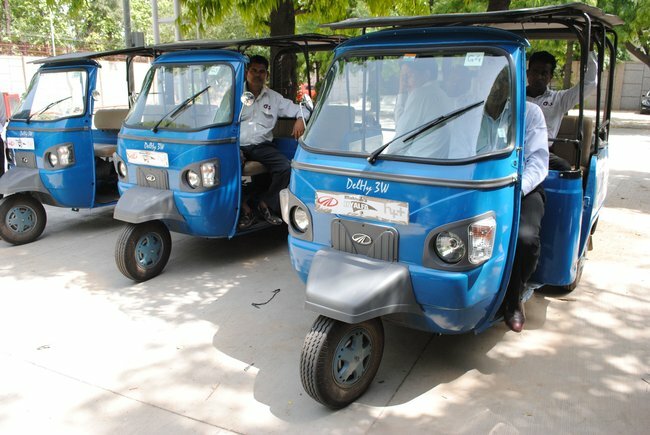 At the Delhi center, hydrogen autorickshaw drivers have been specially trained in safety and refueling techniques and the three-wheelers have been fitted with special sensors to detect leaks. Hydrogen power is commonly based on fuel cell technology, but fuel cells are impractical for developing countries because their parts are expensive and so is the pure hydrogen that they need. The Delhi experiment shows that even lowly autorickshaws can run on lower-grade hydrogen — although they do emit some nitrogen oxide traces. Now, it will require pollution restrictions or enforced conversion of vehicles for hydrogen to gain traction in India, Dr. Lymberopoulos said. Hydrogen could be exempted from taxes on conventional fuels, to encourage private-sector initiatives for hydrogen vehicles and distribution and refueling facilities, he suggested. Though modest, the pilot fleet bodes well for effective collaboration between Indian academic and industrial expertise. “Unless academics and industry joins hands, it is difficult for technology to go to the field,” said Dr. Das. of the technology institute. A hydrogen autorickshaw is also a marriage of two worlds: the advanced clean energy of developed countries, and a humble but widespread mode of transport in developing ones. Thailand and Sri Lanka have also expressed interest in promoting hydrogen autorickshaws.